When you are the Owner of a roadmap, you can assign that ownership to another user on your Roadmunk account. Before you get started, some background on roadmap ownership is in order. As a roadmap Owner, you have special permissions that no other user has. 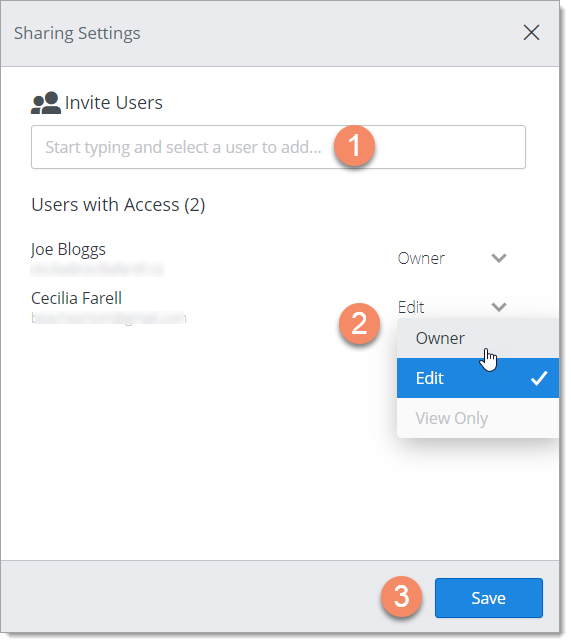 You can share your roadmap with other users and change sharing settings at any time. You can transfer ownership of your roadmap to other users. And you can delete your roadmap. There are two ways to transfer ownership of a roadmap: from your Roadmap Home or directly from the roadmap. Either way opens the Sharing Settings dialog. To go to your Roadmap Home, click the Roadmunk icon on the top-left corner of the screen. 1. On the Roadmap Home navbar, click My Roadmaps. 2. In the Roadmaps panel, select the roadmap. 3. On the Roadmaps toolbar, click the Share icon to open the Share Settings dialog. 1. On the Roadmap navbar, click the Share Roadmap icon. TIP: Mouse over the icon to see how many Editors and Viewers are currently sharing the roadmap, including yourself. To the left of the icon, you can see the Owner's initials (yours) and the total number of users sharing the roadmap in addition to the Owner. On the dialog's Users with Access list, you'll see yourself listed as the Owner of the roadmap. If you've shared the roadmap with other users, you'll see them on the list as well together with their Permissions to the roadmap (Edit for Editors and View Only for Viewers). 1. If the person you want to transfer ownership to is not already on the list, click in the Invite Users field and select their name. You can also start typing the name. 2. In the Users with Access list, click the user's Permissions dropdown and select Owner. TIP: If Owner is grayed-out and you can't select it, it means their user role doesn't allow them to own roadmaps. The Users with Access list should now show the user as the new Owner and you as an Editor (Edit). Who can you transfer ownership of a roadmap to? Only users with a Collaborator role can own roadmaps. This means the person you want to transfer roadmap ownership to must be a Collaborator. You cannot transfer ownership to users with a Reviewer role. In the Sharing Settings dialog, the Owner selection in a Reviewer's Permissions dropdown will be grayed-out and can't be selected. What happens when you transfer ownership of one of your roadmaps? When you transfer ownership of one of your roadmaps to another user, you are automatically changed to an Editor. As an Editor, you no longer have the special permissions given to an Owner. This means that you can't share the roadmap anymore and you can't delete the roadmap.